There’s nothing worse than back fat that hangs over your jeans and clings to any knit clothing showing bulges and folds. Fortunately, Zerona® works well to significantly reduce this fat prone area. With Zerona® you can measure your results. The average patient can lose 3.5 to 11 inches. Image how good your jeans would feel after reducing your muffin top that much! There are no side effects or complications associated with Zerona® treatments. 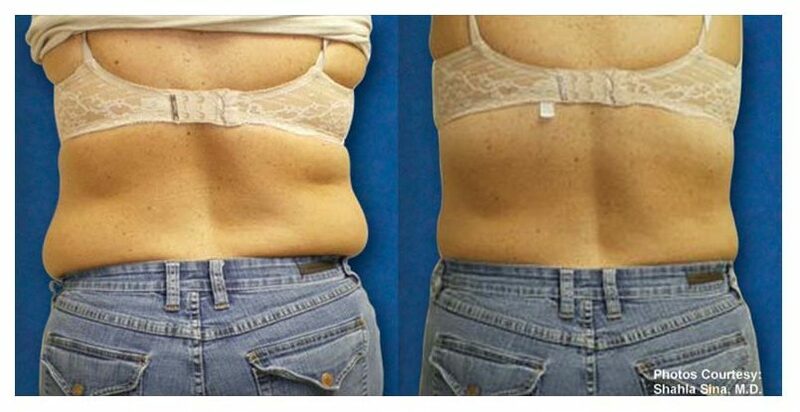 Zerona® treatment is very effective for back fat, muffin tops, and belly fat. This woman had 6 total treatment ofver a two week period which is recommended for optimal results. Treatment are easy, painless, and carefree. each session takes less than an hour. The laser is directed to the targeted area, which is generally a combination of the waist, hips and thighs, for 20 minutes. The Patient then turns over and the same treatment is applied to the opposite side. The minimum suggested treatment period is two weeks, with three full sessions each week. Zerona® is a laser treatment designed to remove excess fat without surgery. Zerona® safely causes the release of fatty lipids from within fat cells causing the fat cell to collapse and shrink to a smaller size, which reduces the circumference of the area treated. The fatty lipids then enter the lymphatic system where they are broken into free fatty acids and used as energy in the cardiovascular system. The treatments are performed at Dr. Lisa Bunin’s office in Allentown, PA. Most patients describe the session as relaxing and comfortable. Since Zerona® only uses cold laser technology, you feel nothing during the procedure. Call and schedule your appointment – 610-435-5333 – for Zerona® to begin losing that excess fat and enjoy wearing body conforming clothing again. Allentown is close to these communities: Pottsville, Lancaster, York, Easton, Bethlehem, Lebanon, and Sunbury.